Going on a cruise vacation but worried that you might get seasick? Fear not friends, because we have some easy steps to follow to avoid getting the least bit motion sick. A lot of first time cruisers are worried they might get seasick on a cruise. In reality, getting seasick does not occur all that often and more than likely you will be fine without doing anything. But if you are worried about the possibility and want to be armed with the right ways to combat this form of nausea, we have some easy to follow tips in this new video. So check out the video and then let us know: What do you do to avoid getting seasick on a cruise? Royal Caribbean cruise ships provide an advanced level of health care options that you might not be aware of. Royal Caribbean provided a look at the medical facilities onboard, that can handle minor issues like sunburn or sea sickness, but also heart attacks, severe hemorrhages, heart attacks and respiratory failure. They vary in size and layout, but all the medical facilities on Royal Caribbean ships meet or exceed the American College of Emergency Physicians’ Health Care Guidelines for Cruise Ship Medical Facilities. All Royal Caribbean ships carry defibrillators and electrocardiogram machines, as well as digital X-ray equipment. New ventilators have been installed to handle a range of respiratory treatments, and complete formularies are stocked in the shipboard pharmacies. Telemedicine enables doctors on board to consult with specialists on shore, as needed, over the Internet. Royal Caribbean has become the first cruise line to be certified as "autism-friendly" by Autism on the Seas. USA Today is reporting the certification means Royal Caribbean will take specific measures to help its guests with autistic families enjoy their cruise. Royal Caribbean's entire fleet now has Bronze Level certification, which means it will provide sensory-related toys, autism-friendly modification to youth activities (where appropriate), autism-friendly movies, priority boarding and dietary offerings (including gluten-free and dairy-free). One tool is a personalized story book folder called a social story that will help explain to autistic children what to expect on a cruise. It covers everything from finding the stateroom to the muster drill, which can be crowded and chaotic. This can help children adapt to the unfamiliar surroundings of a cruise. Another addition will be autism-friendly movies, which will be offered on any trip with at least five autistic passengers. These films, based on accommodations offered by some land-based theaters, will feature family-friendly films. The lights will not be completely turned off, the sound will be lower and it will be acceptable for guests to talk or walk around during the films..
Royal Caribbean plans to reach silver level certification for each of its ships by the end of the year, which will ensure that all youth staff have received basic awareness training in autism and other developmental disabilities. There are also higher-standard gold and platinum levels. The certification standards examine several areas, including staff training, youth programs, pre-vacation planning and services, dining and dietary, disability accommodations, guest satisfaction and feedback, and willingness to work with Autism at Sea staff. Royal Caribbean has joined several other cruise lines in banning smoking on its stateroom balconies as part of a new policy that begins on January 1, 2014. First reported by Cruise Currents, Royal Caribbean has updated its Smoking Policy on its website specifically banning smoking on balconies, which is in addition to a pre-existing ban on smoking inside a stateroom. Anyone caught smoking on their balcony or in their stateroom will be subject to a $250 fee. There will remain a few designated areas to smoke onboard, which are inside the Casino Royale, outdoor areas of the starboard side of all ships; with the exception of Oasis-class ships that will allow smoking on the port side of the ships. In the last few weeks, Disney Cruise Line, Cunard & P&O cruise lines all banned smoking on balconies and it seems like Royal Caribbean has joined in the new trend. Each year, the Centers for Disease Control conducts surprise government health inspections to make certain that the cruise ships millions enjoy are safe and clean. Royal Caribbean's Oasis of the Seas, Jewel of the Seas, Serenade of the Seas and Mariner of the Seas all scored a perfect 100 on their test this year. The Vessel Sanitation Program is run by the CDC and unannounced inspections will occur twice per year in US ports, with a test that grades each ship on a 100 point scale. The CDC evaluates cruise ships in 42 areas such as adherence to proper food handling, storage procedures, overall galley cleanliness and pool and spa cleanliness. This is the third perfect score in a row for Oasis of the Seas while the other ships that scored perfectly have also had perfect scores in the past. Only a small fraction of the dozens of cruise ships inspected each quarter receive a perfect score. Most infractions are small in nature and are corrected quickly. Three cruise ship passengers from Royal Caribbean's Vision of the Seas won a court decision in Brazil after seeking compensation following a norovirus outbreak aboard the ship back in March 2010. The ship departed from Port Santos, Brazil when 348 people onboard were contracted norovirus. Nausea, vomiting and diarrhea were some of the symptoms experienced by the passengers, who resorted to the court system to be reimbursed for the damage. The attorney that specializes in consumer law, Ferrette Sueli Maria Gomes, was approached by three passengers dissatisfied with the consequences of the outbreak. One of the plantiffs was Freire Lourdes Domingues, 79, who was infected and claims to have almost died because of the norovirus. The other two passengers who sought legal action felt changed in Vision's itinerary caused greater injury to them since they were prevented from getting off the ship at their destinations. The trip included stops in Buzios, in Rio de Janeiro and Ilhabela in São Paulo coast. According to the lawyer, setting the value to be paid for each passenger fell to the judge, as Royal Caribbean did not offer to make a deal. The only deal the company was offering was a 25% discount on a future trip. 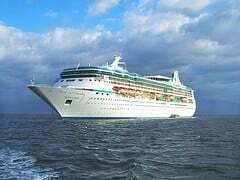 Royal Caribbean had to pay about $33,000, including punitive damages and reimbursement of passages (R$ 2,994.00 each). The compensation was increased to Lourdes, due to contracting gastroenteritis. She received $12,000 in damages only. The other two tourists won £6,000 each by the hassles. Among the complaints made by passengers, is there being only one doctor to serve the people, without priority for children and seniors. Furthermore, it was alleged that the norovirus can spread via unwashed food and water, which was a possible sign of poor hygiene. When asked about the ruling, Royal Caribbean said in a written statement it is appealing the verdict. Royal Caribbean also announced that as soon as the symptoms were detected on board the Vision of the Seas, the ship immediately reported the incident to the ANVISA and "took all actions necessary to ensure the welfare of the guests on board." The company also noted that viral outbreaks can not be directly related to the ship. "A virus from external sources can be installed on the vessel human transmission and thus did not cause any problems as food and water on the ship." Royal Caribbean also mentioned that all ships coming to Brazil are subject to the control of various organs and meet strict standards, controls and taxes from international organizations. 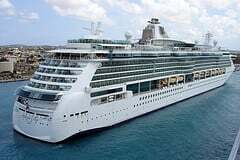 United States Coast Guard reported that a 75 year old cruise passenger had to be evacuated by sea from Royal Caribbean's Jewel of the Seas after he fainted. The Coast Guard was called at 6:12pm and a 45-foot vessel was sent to take the man and his family to Medical Center of Trinity in Tampa, Florida. The cruise passenger had an irregular heartbeat after he fainted and it was determined by the ship's doctor that the best course of action was to get him off the ship. 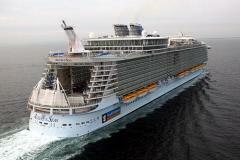 Recently another Royal Caribbean ship was affected by a norovirus outbreak, where many passengers became very sick. Over the years we've heard reports of outbreaks on other ships but there are definite precautions you can take to avoid getting sick yourself. Norovirus is a virus that causes acute gastroenteritis. This means people will have symptoms like diarrhea, vomiting, and stomach pain. 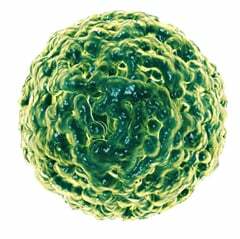 Noroviruses spread from person to person, through contaminated food or water, and by touching contaminated surfaces. Norovirus is recognized as the leading cause of foodborne-disease outbreaks in the United States. Outbreaks can happen to people of all ages and in a variety of settings. Generally speaking, people with norovirus illness are contagious from the moment they begin feeling sick until at least 3 days after they recover. Washing your hands, especially after using the restrooms and before eating or preparing food. Avoid shaking hands during outbreaks. Do not prepare food for others if you become sick for up to 3 days after becoming sick. Wash laundry that may be contaminated with vomit or stool.